Today’s recipe is a dessert mash-up of the best kind: a classic layer of chocolate chip cookie dough gets frisky with a thick, fudge-y brownie base. And it’s gluten-free! I haven’t come across a single person that doesn’t like a classic chocolate chip cookie or gooey brownie. If I have, they’ve never admitted it–probably wise on their part. I’m not sure how much I could trust a person that admitted to not liking either classic dessert. These Gluten-Free Chocolate Chip Cookie Brownies are the best of both worlds. A thick, gooey layer of gluten-free brownie mix is the base for a generous layer of crisp, buttery chocolate chip cookie batter–gluten-free, of course! They get all sorts of snuggly and bake up deliciously together. When you take your first bite, it just feels right, like a pair of perfectly broken in Converse Chucks. So you have a second bar, and then you indulge in a third, because why wouldn’t you? Don’t be surprised if you dream about them at night and wake up to find yourself making your way to the kitchen to snag one. 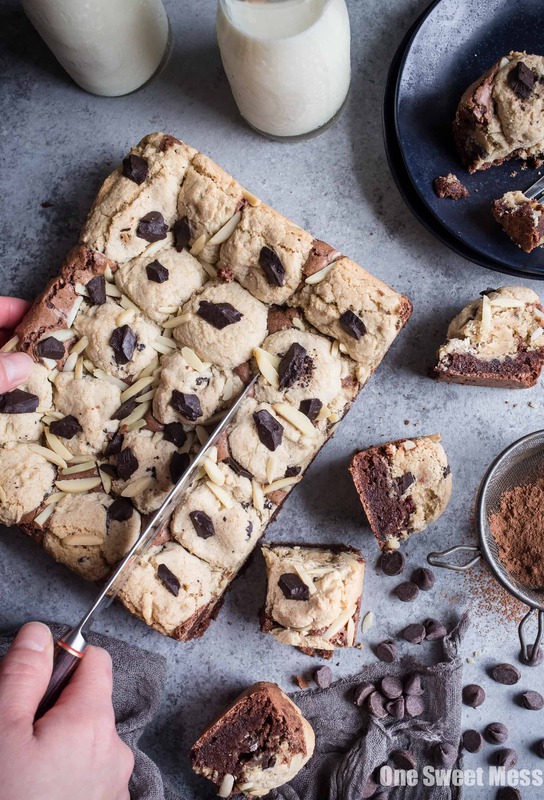 While these Gluten-Free Chocolate Chip Cookie Brownies take a smidge more effort than your basic brownie or cookie, they’re most definitely worth every bit of effort. Basically, you’re making a batch of chocolate chip cookies and a batch of fudge brownies and combining the two. It’s as simple as that. The magic happens in the pan as they bake and become fast friends in the oven. If you don’t feel like putting in the effort to make this dessert mash-up, you can always make a batch of these Gluten-Free Cherry Almond Shortbread Bars or Brown Butter & Toasted Almond Chocolate Chunk Cookies. Either way you’re winning. Gluten-free or not, these brownies are bangin’! Preheat oven to 350 degrees F. Line a 8-inch-by-8-inch square baking pan with parchment paper so that it overlaps on each side. Spray the parchment paper with non-stick baking spray or coconut oil. To make the brownie batter, add melted butter, oil, sugar, eggs, and vanilla extract to a large bowl. Whisk until pale in color, about 1 minute. Add flour, cocoa powder, and salt to the bowl. Using a rubber spatula, fold the dry ingredients into the wet ingredients until combined and the batter is smooth. Transfer the brownie batter to the prepared baking pan, spreading the batter evenly into the bottom of the pan. To make the cookie dough, add the butter, granulated sugar, brown sugar, and vanilla extract to the bowl of a stand mixer fitted with the paddle attachment (or to a large bowl using a handheld mixer). Beat until light and fluffy, about 1 minute. Scrape down the sides of the bowl and the egg, beating until just combined. Scrape down the sides of the bowl. Add the flour, baking soda, and salt to the bowl. Beat on low until just combined. Fold in the chocolate chunks and slivered almonds. Using a 1-tablespoon scoop, drop the batter directly on top of the brownie batter until the brownie batter is covered. Gently press the down on the cookie dough so that it sinks into the brownie batter slightly. Bake for 30-35 minutes, or until the cookie dough is golden brown in color. Cool in the pan completely. Remove from the pan and cut into squares. Store in an airtight container for up to 5 days. AHHH YUM! I cannot believe these are GF-you’re amazing!